DIY home renovation. How hard could it be? Thanks for reading our silly little blog! As the disclaimer says, we aren't professionals in either blogging or house stuff, but we try. This is mostly to let our friends and family know what we've destroyed so far in the house. We post irregularly and usually forget to take pictures, so thanks for your patience, and please feel free to comment with your thoughts and suggestions! The previous post on the corner rebuild included the supporting of the floor joists and the trusses to prepare for cutting out the rotted sections of wood. 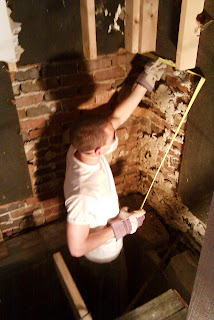 Unfortunately, I forgot a camera the morning of the tear out so the first picture that I have of the removal is at the point where we had removed the rotted exterior black board, the rotted wall stud sections, the rotted floor joists and seal plates. You can see the cap blocks from the foundation, the exposed brick where we cut away the ruined exterior sheeting, the removed floor joist sections and the removed wall stud sections. There was a lot of expert Sawsall operating in order to cut out the seal plates and joists running along the tops of the cap blocks. We used dad's new Rotozip tool (Dremel on steroids) to get to a few locations that we couldn't get the Sawsall. After a lot of sweating, bleeding and swearing, dad and I had all of the rot and debris out of our way. My new Ridgid 12 gallon wet/dry vac performed wonderfully to pull all the small debris and mold out. The next step was to build the replacement piece complete with seal plates, cap joists and extending floor joists. 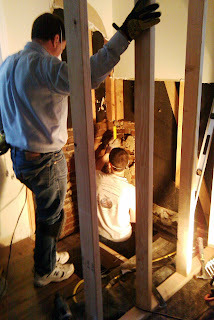 We built the entire segment in the garage and transported it into the room because we would not be able nail the joists on once we got it into place. We even put strips of the exterior sheeting along the backside because we would not be able to slide the sheeting into place at a later time. 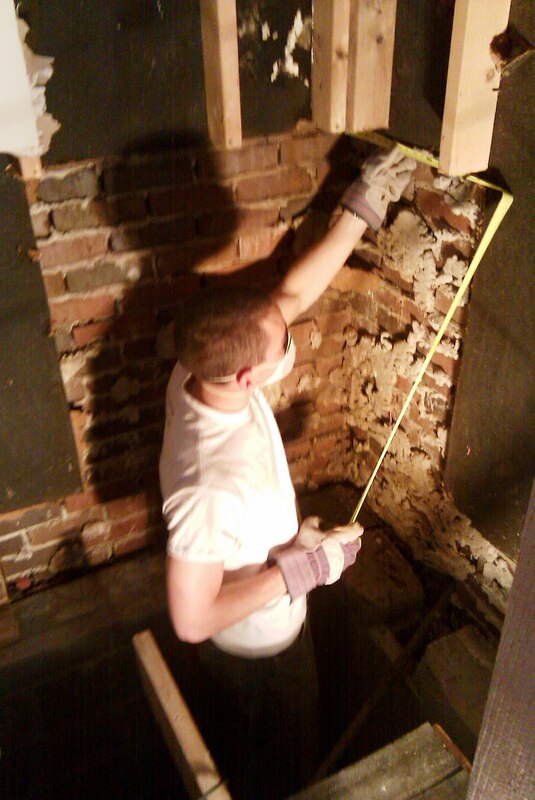 This picture shows dad measuring joist lengths for the seal plate and cap joist assembly. The following image shows us starting to move the section into place. I had to get under the assembly and chip away some excess mortar on the bricks because we couldn't get it to slide into place. Getting it into place was a painful experience. You can also see a trail of F26 adhesive on the block that was used to seal and adhere the section against the block. The seal plate was made of a treated 2x6 to ensure rot resistance in the future in this corner. Dad is passing materials down to me in this picture for "scabbing" the old and new sections of floor joists together. We used the construction adhesive on all of these operations to ensure full strength in the joist rebuild. We also used a lot of nails. It was a pain moving the framing nailer around in those tight places. This next image shows the finished product of our work. No more flimsy, sinking flooring! The next image shows the floor decking in place. Finally, we finished out the day by squaring off the exterior sheeting and measuring/cutting out the new exterior sheeting pieces. Dad had to work the next day for Numed so I took charge of replacing the stud sections. That will be the subject of the next post. Hi! I'm a GT grad student who happens to like working on the house (i.e. decorating the house and planning renovations) in addition to doing research in aerospace engineering. I love baking and cooking, and aspire to be a gardener and decorator extraordinaire. It's kind of weird for a nerd, but that's ok. Follow me on Pinterest!